The Coit Tower is a landmark in San Francisco, California. 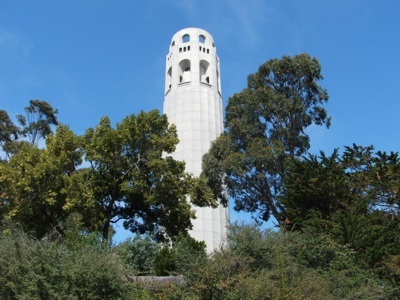 It is located on the top of Telegraph hill, and was funded by a bequest by Lillie Hitchcock Coit, which was dedicated "to be expended in an appropriate manner for the purpose of adding to the beauty of the city which I always loved." The tower is 210 feet (64 meters) tall, is made in the art deco style, and was dedicated in 1933. The tower contains murals by 26 artists. Additionaly an elevator ride to the top of the tower is available. From the top, there are spectacular views of the city of San Francisco and the surrounding Bay area.